Four more people have died of E. coli infections spread by romaine lettuce and 25 more illnesses have been reported, the Centers for Disease Control and Prevention said Friday. The outbreak is over and romaine lettuce is no longer on the warning list, but reports of cases in three more states have come in, the CDC said. A total of five people have died and 197 reported sick in the outbreak, the largest E. coli outbreak in the U.S. in more than a decade, the CDC said. It can take a while for case reports to make their way to the federal level from state and local officials, and people often do not die right away from complicated E. coli infections. “Most of the newly reported cases are people who became sick two to three weeks ago, still within the window when contaminated romaine was available for sale,” the CDC said. Most E. coli bacteria are harmless, but one strain, called E. coli O157:H7, can cause severe disease. It may cause severe stomach cramps, bloody diarrhea and vomiting. The bacteria can be spread by contaminated water, animal manure or in undercooked beef. This strain is involved in the Yuma romaine outbreak. “Eighty-nine people out of 187 with available information (48 percent) have been hospitalized, including 26 who developed a type of kidney failure called hemolytic uremic syndrome,” the CDC said. Romaine is no longer being grown in the Yuma area and the CDC and the Food and Drug Administration both said lettuce grown elsewhere is not involved in this outbreak. The FDA said it may take a while to find out how the bacteria got into so much of the romaine lettuce supply. “Any contaminated product from the Yuma growing region has already worked its way through the food supply and is no longer available for consumption. So any immediate risk is gone,” FDA Commissioner Dr. Scott Gottlieb and Dr. Stephen Ostroff, FDA’s Deputy Commissioner for Foods and Veterinary Medicine, said in a joint blog post. 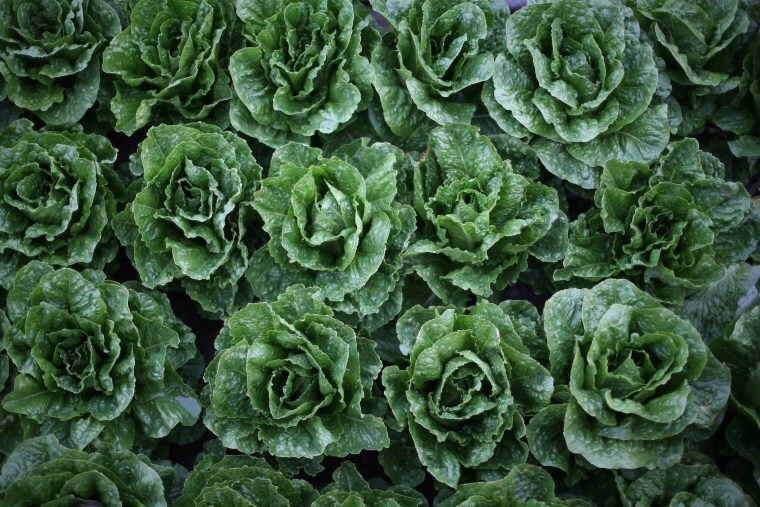 But in early spring, Yuma is the main source for lettuce sold across much of the U.S.
Gottlieb and Ostroff said the FDA is working to track the source of this outbreak, but is so far coming up with very little. Researchers have to visit people who are reported sick, test them to make sure they were infected by the specific strain being investigated, and then question them intensively about what they ate or drank days and weeks before. “Traceback involves working backwards from the point of consumption or purchase of the product through the supply chain,” Ostroff and Gottlieb wrote. Last winter, Consumer Reports criticized the CDC and the FDA for not warning people away from romaine lettuce when there was a similar outbreak, but the CDC said at the time that it couldn’t pinpoint what type of salad green might be responsible. The CDC estimates that foodborne illnesses affect 47.8 million people in the U.S. every year, putting 127,000 into the hospital and killing more than 3,000.